» Archive by Category "Cleaning"
Why would a Wasteless Pantry website have a blog post on decluttering? How unrelated could that be? If you have so many things in your home that you can’t find what you need then this is a waste. If you buy the same thing again because you didn’t know you already had one, then that is a waste. And if you lose time or peace of mind everyday trying to control all the clutter that accumulates then you know what I think that means…. I love to chat about all things decluttering! I will post this in a series of bits and peices because if you let me I’ll go on and on about it all day!! These are ideas that I have collected from too many sources to quote and have been tried and tested in my own home. First off start with the end in mind – do you want completely clear or just less than now? If you want clear – remove everything from one tiny space, like a chair that collects clutter or one shelf or one draw, only put back what you LOVE. If you are sure you don’t love it get rid of it – sell, donate, recycle or trash. If you’re not sure then put it in a box in the garage or shed with a date (one or two months). If it doesn’t get rescued by the due date then it goes. If you simply want less – same process but just one box at a time that leaves the house. Only ever focus on one tiny space at a time until you get the feel good – ahhh – moment when you look at that space. Protect that space above all others. Don’t do too much too quick. Avoid looking through the box a second time before getting rid of it – you’re instincts are right and you don’t need to second guess yourself. But what do you do with items that you want to keep but don’t fit anywhere in the location where they belong because you haven’t decluttered that space yet? You’re not going to like this answer but in reality I put the stuff in a box and shove it wherever I can in that room until there is space. I know this sounds really bad but the idea is to not get side tracked and miss out on the feel good from the space you are tackling. Yes it feels off to be cluttering up other areas but they were cluttered anyhow. Sometimes you have got to get the motivation from that single focus to overcome the overwhelm and inertia. Once I’ve sorted that one little space I can free up my energy to tackle the next. I try to prioritise spaces by what will have the biggest impact for me – visual or functional. Like in the kitchen the visual of a clear bench is awesome, but the functionality of being able to get a cup out without fighting 50 others spilling is also important. But the cupboard with serving platters that get used maybe once a month might not be a priority until the other two have already been tackled. Put all like things together too – all your pens together or all your serving utensils, etc – you might find duplicates (or more) – ‘keep the best, get rid of the rest’. Seeing them together makes the decision easier sometimes. Also think about storage more liberally – maybe you can ‘store’ some of your gear at a friends or family members home where it will get used more often and then you can call upon it when you actually need it. For example, my brother has a fan we weren’t using much – if we have a family function where it would be handy we could just ask that he bring it along. It’s not necessarily about ownership, simply sharing things so they get used to their best advantage. Just something to think about – not for everyone, I know. Make life simpler and waste less, one pantry shelf at a time. 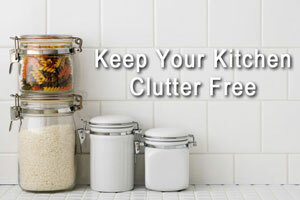 Are you inspired to tackle the clutter or have your own tips to share? Leave your comments below or share on our Facebook page.